Note tight shingle radius at the rolled eaves and rakes. Designed by architect Francis Harvey Slocombe, this San Jose, California “Storybook” style funeral chapel is a close replica of another built in Berkeley a few years earlier. 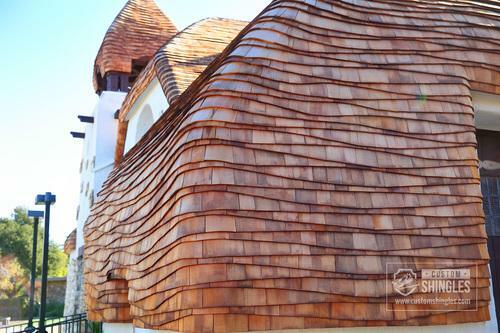 The signature element is the bent and/or waved wood shingle roofing, itself an uncommon technical skill. Huber & Associates of Lake City, Florida was selected to do the work, because of their proven expertise, and the result speaks for itself. Look at the tight radius the shingles make at the eaves. How do they do that? The simple answer is steam bending, but there is clearly much more to it than that. Detail curved hip on Storybook roof. Note undulating courses. Slocumbe’s signature building was the 1947 Mapes Hotel, in Reno, demolished in 2000. Video at the link. 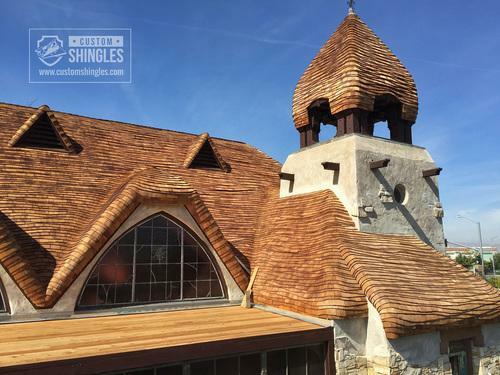 This entry was posted in Roof Restoration and tagged California, Roofing Slate and Tile. Bookmark the permalink.